About 16km. (10½ miles) taking between 5 and 6 hours. Adlington Road car park, Bollington. From the car park, cross the road into the park opposite and follow the path beside the stream then cross a footbridge after 100 metres to follow a path with the stream on your left. At the far end of the park, join the road under a high arch bridge. At the traffic signals, branch right into Water Street. At the end, at the Queen’s Arms pub turn right uphill. At the end by the Red Lion pub turn left. Shortly, opposite the turning to Lord Street, turn right onto a flagstoned path up the right hand edge of a field. At the end, pass through two gates and continue up a steep hillside by the fence (the steepest section of this walk) and on reaching a track, keep ahead up a stepped path to the summit and White Nancy Monument. 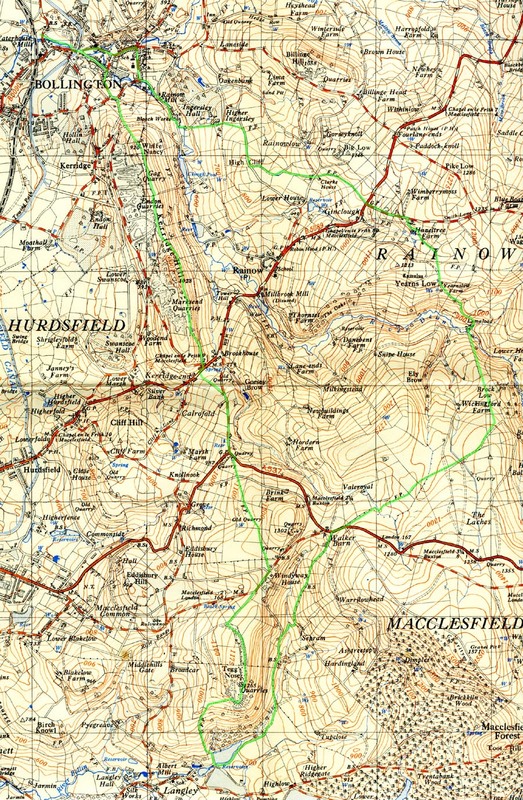 Continue southwards along the crest of the ridge, shortly through two kissing gates, and stay with the crest of the ridge passing the trig point after about half a mile. After another 300 metres continue with the path leaving the ridge and veering left to descend via the eastern flank of the hill. Later the path levels out to reach a gate and stile. Continue down the lane to the main road. Turn right and in 50 metres cross the road to a path opposite up a flight of steps. Keep the field boundary on your right to reach a lane and here turn right, gradually ascending to the A537 Buxton New Road. Turn left then shortly right on a path marked with way markers with the letter ‘G’ which denotes The Gritstone Trail. Stay with this path ascending over the shoulder of the hill, veering slightly left after passing through a gate in a substantial wall. Reaching the next road turn right and shortly left to reach the Teggs Nose Country Park Visitor Centre (Toilets and information). From the entrance road of the Country Park, the main walk continues south on a gravel path initially parallel with the road to reach the second gate, and here turn left up some rough steps with a handrail. Continue with the good gravel path up through old quarry workings and later keeping right around the southern end of Tegg’s Nose. Stay with this path for another 100 metres then turn left downhill (still with ‘G’ sign) on a smooth grassy path shortly passing a wooden seat. Continue with a long descent, with steps towards the foot then over the dam of the first reservoir (Teggsnose Reservoir). Turn left on a track at end and in 400 metres bear left over a small stream with stepping stones. On reaching the next lane turn left. Stay with the lane, gradually ascending to the A537 at Walker Barn. At the main road, turn right and walk up to the Peak National Path boundary Sign (a millstone on a plinth). The path you need is hidden behind the sign. Branch left on this path keeping the field boundary on your left in the first field and in the second field veering right then left over a stream. Continue in the same direction on a well signed and defined path crossing several fields. Later cross a wooden footbridge by a telegraph pole, and in another 200 metres veer left with the track at a fork. Gradually descend towards woodland and here turn left over a stile. Keep along the field boundary and over the next stile, with a prominent wooden post on a small hillock on your right. Follow the well defined path down across the field to a stile near the left hand edge of the next wood. Continue ahead along the left hand edge of the wood, descending to Lamaload Waterworks. Skirt around the right hand side of the waterworks and adjacent house and veer left uphill signed Rainow via Yearnslow. Pass a farmhouse to join a rough track and at the crest of the hill where the track veers left across field, leave the track and keep to the right hand edge of field to a stile in the corner. In the next field walk diagonally left to the gap in far left hand corner. Keep left with some woodland on your left in the next field and shortly over stile pass between the house and a triple garage. In the ensuing field cross a wooden footbridge then veer right (path diversion) and follow the diversion to a minor lane. Continue uphill, shortly reaching a road and here turn left downhill for 400 metres. At the T-junction, cross to path opposite and keep the field boundary on your left through several fields. At the end turn left onto a lane and in 30 metres turn right on a path through the farm yard of Crofts Farm. From the end of the farm yard, take the enclosed track ahead and later stay with this track to its end (gate and way marker). Turn right onto another enclosed track for 300 metres to a point where there is a recess in the wall with a gate. Turn left down the track and aim for the far right hand corner of the field. Pass through the left of two stiles, and continue downhill along the field boundary with buildings over on your right. Later veer left to the valley bottom crossing a stone bridge to reach a track. Turn right, shortly passing derelict factory buildings then continuing with a lane to reach The Crown pub. Turn right along Church Street to reach a mini roundabout. Turn left here down through Bollington, eventually reaching the high arch bridge. The walk then is as your outward route to the car park. Please take care, the publishers cannot be held responsible for the consequences of any error or omission or of any reliance which is placed on the information provided.